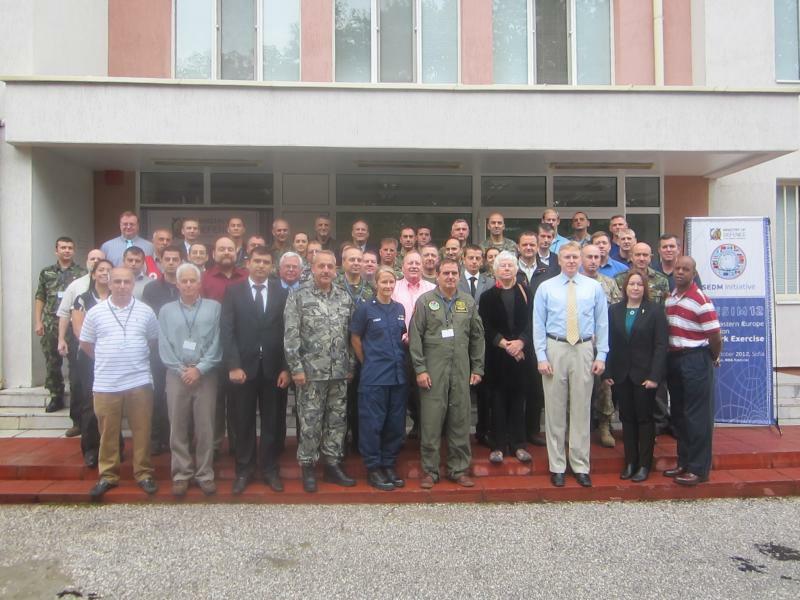 The Republic of Bulgaria hosted the sixth exercise in the South Eastern Europe Simulation Network series SEESIM. The SEESIM 12 computer-assisted exercise was conducted at the National Military Training Complex "Charalitza" 15-19 October 2012. It was distributed to the following ten locations: Albania, Bosnia and Herzegovina, Bulgaria, Croatia, Italy, Montenegro, Serbia, Macedonia, Ukraine, and SEEBRIG HQ in Larissa, Greece. The SEESIM series of civil-military disaster relief exercises have been conducted since the year 2000 as an initiative of the South Eastern Europe Defence Ministerial (SEDM) process. Each SEESIM Exercise has a two-year planning cycle. Participants in the SEESIM 12 include: member and observer SEDM countries; SEDM′s South Eastern Europe Brigade (SEEBRIG); the United States of America and Sweden as supporting nations; Georgia as an observer; and various non-governmental and international organizations such as the Euro-Atlantic Disaster Response Coordination Centre (EADRCC). Representatives of the following NATO organizations will also be conducting or supporting parallel experimentation in the area of distributed training and exercises: HQ Supreme Allied Commander Transformation (HQ SACT) – Norfolk, Virginia; Joint Warfare Centre (JWC - Stavanger, Norway); Joint Force Training Centre (JFTC - Bydgoszcz, Poland); and the NATO Modeling and Simulation Center of Excellence (M&S COE Rome, Italy). The goal of SEESIM 12 is to establish cooperative relations and common procedures among the countries from the region as well as to facilitate and accelerate the process of requesting and providing assistance in response to natural disasters and terrorist attacks. This is the first SEESIM Exercise to utilize tools provided by NATO, including computer instruments and models for planning and conducting exercises of this type. Bulgaria used this Exercise for testing and experimenting with simulation systems and for introducing new information technologies designed to increase the efficiency of civilian and military structures in the region in response to natural and man-made disasters. A regional initiative led by Bulgaria to build a network for planning exercises in the region will also be tested during SEESIM 12. The broad scenario of the Exercise was based on a series of cyber attacks against the governments of the countries in South Eastern Europe, followed by biological or chemical terrorist attacks and a large-scale natural disaster. These events resulted in a breakdown of communications and great loss of life. The Exercise activated SEEBRIG′s Engineer Task Force and the national crisis response centers of participating countries. A Distinguished Visitors′ (DV) Day took place in the National Military Training Complex "Charalitza" on 19 October 2012. The Distributed Training and Exercises (DTE) experiment in conjunction with the regional South Eastern Europe Simulation Exercise (SEESIM 12) culminated at the National MilitaryTraining Centre. The DTE experiment was sponsored by the Deputy Chief of Staff, Joint Force Trainer (JFT). SEESIM 12, co-hosted by U.S. European Command, is one of Europe′s largest computer-assisted crisis management/disaster response exercises. However, this year is pivotal as it marks the first year the exercise included NATO organizations and tools.